The majority of bacteria exist in settled communi­ties, referred to as biofilms. Contrary to their planktonic (free-swimming) counterparts, bacterial cells in biofilm are embedded within an extracellular matrix, which serves the bacteria as a shelter and a shield protecting from antimicrobials and immune system components. Biofilms develop easily on tissues (most preferably damaged) and on abiotic surfaces (i.e. dressings, cath­eters, intubation tubes (Flemming et al., 2008; Pradeep et al., 2013; Bjarnsholt et al., 2008). 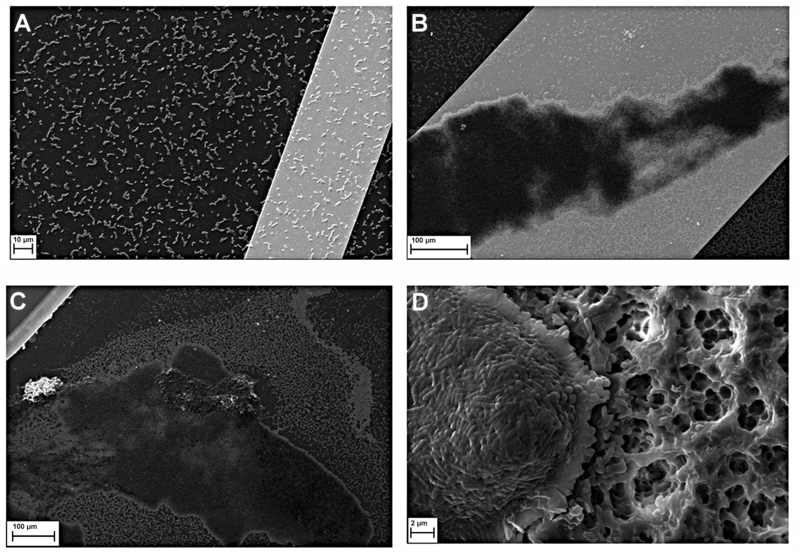 Biofilms are responsible for up to 80% of nosoco­mial infections (James et al., 2008). Presently, there are neither biofilm-resistant medical implants nor proce­dures guaranteeing biofilm eradication. The only excep­tion, to some extent, are non-specific actions such as surgical removal of infected tissue or removal of a colo­nized implant. However, the above mentioned proce­dures are not always possible or safe for the patient. Therefore, there is an urgent need to develop diag­nostic tools for an early detection of biofilm presence. Sensors, measuring physical value referred to as imped­ance, display promising properties that may be used for this purpose (Ben-Yoav et al., 2013; Zhenga et al., 2013; Padresa et al., 2013). Impedance describes the potential of natural objects to resist the electric current flow and to store energy in the form of electric or magnetic field. All physicochemical changes occurring within biologi­cal systems have an impact on their electrical properties and affect the impedance value. Also such important biological phenomena as fluctuation of ionic concen­tration, cell division or adhesion to the surface, may be potentially detected by impedance sensors (Ge et al., 2008; Hakki and Bozkurt, 2011). The most important advantage of using impedance microsensors is the pos­sibility of real-time monitoring of these changes. Other advantages are non-invasiveness, label-free detection (no markers needed) and provision of data concerning electrical properties of the environment. The detection of bacteria by means of impedance microsensors may be helpful in virtually all flow sys­tems endangered by the development of microbes. Among the examples of such systems in nosocomial settings are indwelling catheters, nutrition accesses or hospital water distribution pipes (Taeyoung et al., 2011; Munoz et al., 2006). As the majority of impedance-related research on biofilm is still at the preliminary level (Dominguez-Benetton et al., 2012), the aim of this study was to con­tribute to the exploration of this issue. 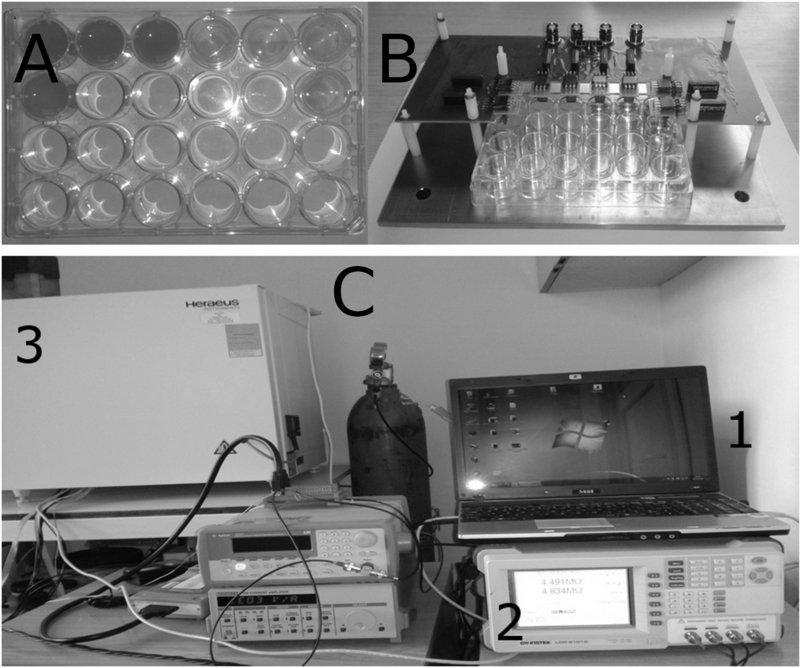 Thus, specially designed impedance microsensors were applied for the real-time analysis of biofilm growth of Pseudomonas aeruginosa, a recognized nosocomial pathogen. Impedance microsenors with interdigitated elec­trodes (IDE) were used in the experiment. The elec­trodes were made of vacuum-evaporated gold on PYREX glass with a titanium adhesion layer. The dis­tance between the electrodes and the width of the elec­trode digits were 20 μm. The area of the electrodes was 0.6 × 1 mm. The shape and contact pads placement of the sensors allowed to mount them manually to the micro USB plug and to place them vertically in the wells of a 24-well plate (CellStar, Germany). The sensors used for the experiment are presented in Fig. 1. To prepare electrodes, sensors were rinsed in distilled water, then in acetone and in isopropanol, finally. GW InstekLCR-8101G was used as Impedance Ana­lyser (IA). The measurement system was designed to handle 8 sensors. It consisted of a suitable 8-channeled switch and the above-mentioned IA (Fig. 2). Such a setting allows to perform quasi-simultaneous measurement of the sensors placed in different wells of a microtitre plate. The measurement system was con­trolled by a PC computer with a customized software described in more detailed manner in (Piasecki et al., 2012) (Fig. 2). Real-time impedance measurement of biofilm formation. A reference P. aeruginosa ATCC 14454 was used for experimental purposes. The ability of the afore­mentioned strain to form biofilm on abiotic surfaces has been already recognized in the previous work of the authors (Junka et al., 2013). An overnight culture of the investigated strain was diluted to 1 McFarland using a densitometer (Biomerieux, Poland) and sub­sequently to 103 cfu/ml using dilution method. Two ml of the strains’ culture was introduced to the wells of the plate. Next, the sensors were mounted asepti­cally in a 8-channel switch and placed in the wells. 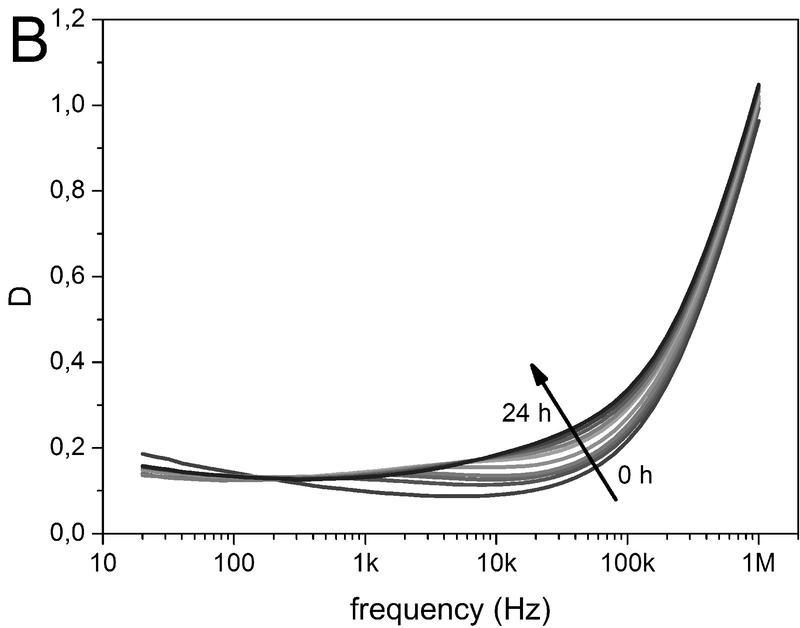 Impedance spectra of each sensor were measured for 24 hours/37°C using the impedance spectroscopy method with four minute intervals. Pure Tryptic Soya Broth (TSB, BioMerck, Poland) was used as a negative control of the experiment. The obtained impedance spectra were analysed using the Electrical Equivalent Circuit (EEC) method. A special EEC was created for this experiment (Fig. 3). It allowed to model conductivity and polarization pro­cesses occurring in the impedance sensor area (medium and biofilm). Two EEC components describe the phe­nomena taking place on the electrodes of the sensors. These are CPE and Rp (capacitance of electrodes-envi­ronment interface and parallel to it resistance, respec­tively). The admittance of CPE is given by YCPE ( ) where Q and n are the parameters and ω is a radial frequency (Barsoukov and Macdonald, 2005). The values of these parameters were calculated for each of the time-points using ZView software by Scribner. 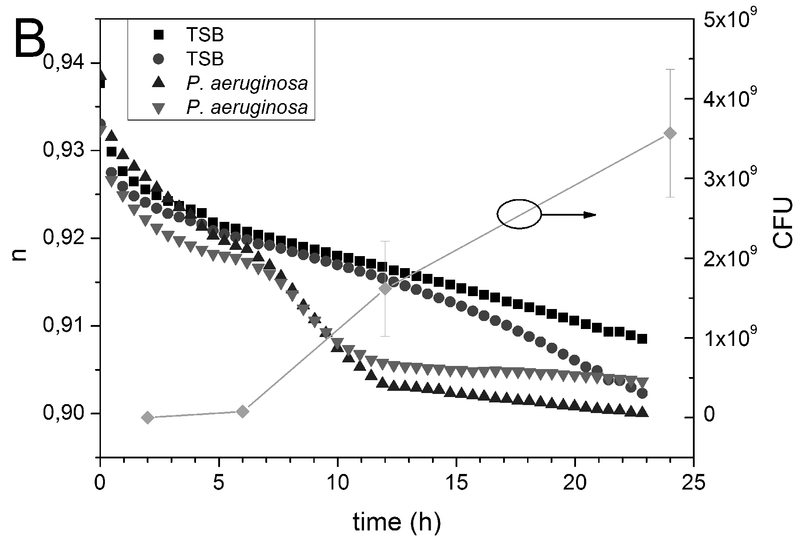 Rp, Q and n were analysed with regard to the process of P. aeruginosa biofilm formation. Quantitative cultures. The P. aeruginosa strain and the impedance apparatus were prepared as described above. The strain was incubated in the presence of sen­sors for 2, 6, 12 and 24 hours. Next, the sensors were aseptically removed from the apparatus, rinsed with saline, and transferred to 1ml of mild detergent – 0.5% saponine (Sigma Aldrich, Poland). The sensors were vortex mixed for 1 minute to remove biofilm from their surface. Subsequently, the obtained suspensions were diluted 10–107 times. 100μl of each dilution was cul­tured on a McConkey Agar Medium (Merck, Poland) and incubated at 37°C for 24 hours. Next, the bacterial colonies were counted and the number of bacterial cells forming biofilm was assessed. Electron microscopy. The strains were allowed to form biofilm on the sensors’ surface under the condi­tions described above. Subsequently, the sensors were aseptically removed from the apparatus, rinsed 3 times with saline to remove non-adherent bacteria and dried at 37°C/4 hours. The dried samples were covered with Au/Pd (60:40, sputter current: 40 mA, sputter time: 50 sec) using QUORUM machine (Quorum Interna­tional Forth Worth, USA) and examined on Scanning Electron Microscope Zeiss EVO MA25. Biofilm dynamics. After two hours of incubation, pseudomonal cell clusters were found on the sensors’ surface (Fig. 4, upper left side). Quantitative cultures revealed the presence of ca 104 colony forming units of bacteria on the sensor. During the next four hours, the number of bacteria increased to 108. Therefore, this period may be identified as an intensive growth phase. The surface of the sensors was partially covered with a dense multi-layered bacterial biofilm. Although slower than previously, after 12 hours from the begin­ning of the experiment the number of cells was still increasing. This suggests the phase of biofilm matura­tion. After 24 hours, virtually the entire surface of the sensor was covered with biofilm in different stadia of development (Fig. 4, lower right side). Electrical measurements. Changes of the envi­ronment’s physicochemical properties detected by the sensors are presented as a set of impedance spectra in the form of serial capacitance and dissipation factor (Fig. 5). The measured data were analysed using Electri­cal Equivalent Circuit (EEC) modelling. Such approach allows to obtain qualitative infor­mation about the measured object from impedance spectra. 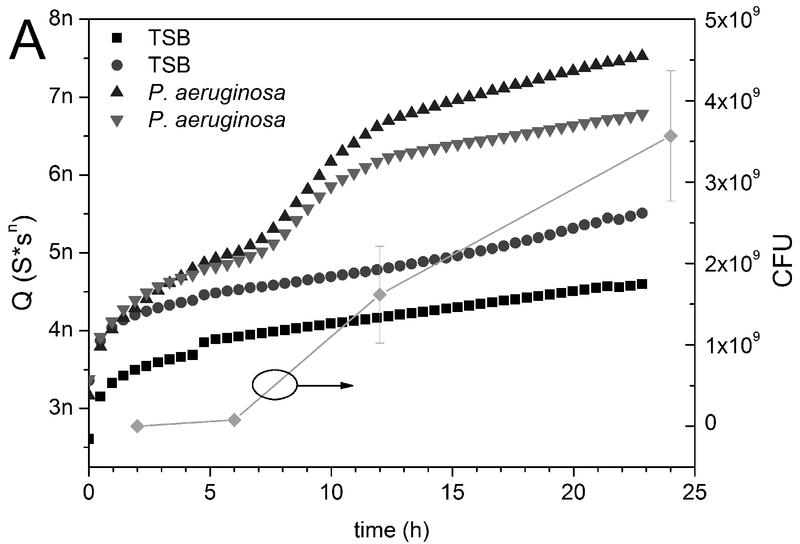 As can be seen in Figure 6, all three analysed parameters – Rp, Q and n, were informative for the purposes of analysing P. aeruginosa biofilm formation. The Q parameter was found to be positively correlated with increasing number of cells on the sensors, whereas the n value decreased along with biofilm development (Fig. 6A-B). From the 6th hour of the experiment, the differences in Q measured in the control and tested well started to be visible and such a state continued for another 5 hours. Afterwards, the value of the Q param­eter in the tested sample resembled that of the control again. A different type of results was obtained for Rp. 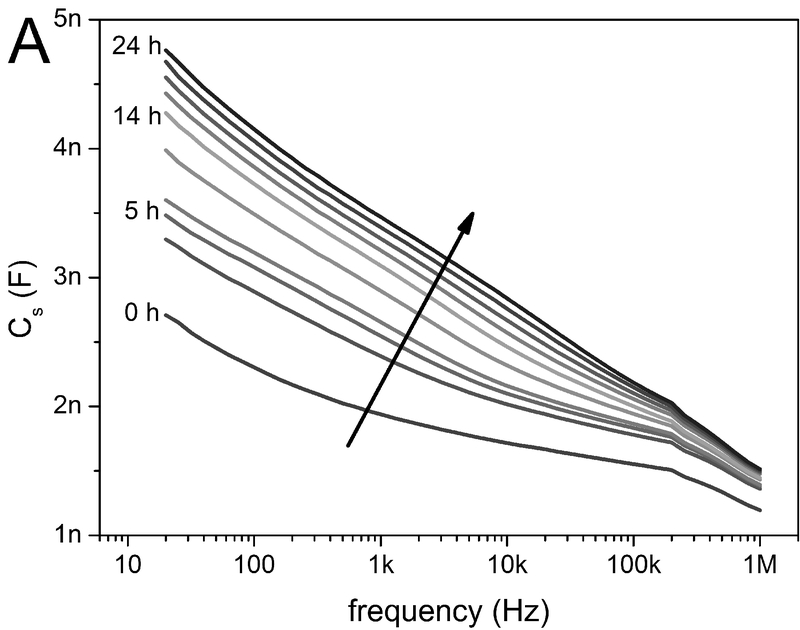 The value of this component was slowly and uniformly increasing until the 11-th hour of the experiment and increased rapidly afterwards, reaching the value of 1015 ohm (Fig. 6C). In the in vitro setting applied, pseudomonal biofilm underwent all specific stages of development, including adhesion, matrix synthesis and maturation (Fig. 4). As it was shown, the impedance sensors used were able to distinguish between bacteria-free and bacteria-containing environment. This ability offers application potential, especially as the value of one of the parameters analysed, namely Q, started to rise as early as after 2 hours from the start of the experiment, along with an increasing bacterial cell number. 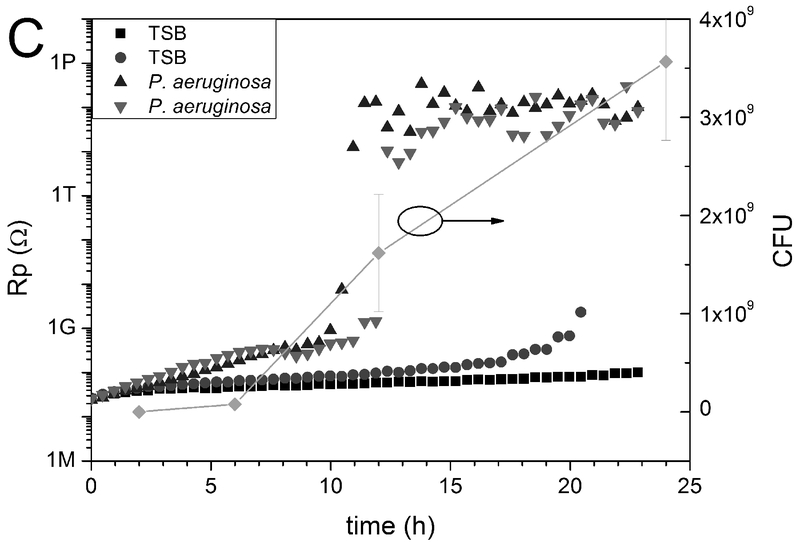 Moreover, Q values seemed to correlate with the phases of bacterial growth on the surface of the sensor (Fig. 6A). On the other hand, during the first 6 hours, the differences of the n value measured for control and bacteria-containing environment were not as distinct as in the case of the Q parameter. Thus, it may limit the potential applicability of the n parameter for biofilm detection. Further experiments should be performed to interpret the results obtained for n, with special attention to the phenomena taking place between6th–11th hour from the beginning of the experiment. Puzzling results were obtained for Rp, the third parameter analysed. After the 11th hour of incubation, the value of this component increased significantly. According to the electrical model applied, such a phe­nomenon may be explained by a loss of DC conductiv­ity. It might be the result of biofilm development on the entire surface of the electrodes. However, the discussed rise of the Rp value took place late in the course of the experiment. At that time, vast biofilm clusters formed on the sensors were seen not only by means of electron microscopy (Fig. 4) but also with the naked eye. There­fore, Rp for biofilm detection is useful only in systems where optical detection is impossible. Still, at least one of three tested parameters, namely Q, may be useful for the analysis of bacterial biofilm formed on the sensors’ surface. This finding, confirmed by electron microscopy and microbiological techniques, may be helpful in future development of clinical appli­cations. Biofilm-related infections represent a major threat to patients undergoing invasive nosocomial pro­cedures. The presented study aims to be another brick in the wall built for the patients’ protection. The applicability of Rp and n parameters for the detection of biofilm presence seems to be limited. The value of Q changes along with biofilm phase of growth. The suitability of this parameter for biofilm detection is promising, although further experiments need to be performed. This work was supported by Wrocław University of Technology statutory grant no. S30035. Barsoukov E. and J.R. Macdonald (eds). 2005. Impedance Spectroscopy: Theory, Experiment and Applications, 2nd ed. John Wiley & Sons, Inc., Hoboken, NJ, USA. Ben-Yoav H., A. Freemanb, M. Sternheimc and Y. Shacham-Dia­manda. 2011. An electrochemical impedance model for integrated bacterial biofilms. Electrochim. Acta. 56:7780–7786. Bjarnsholt T., K. Kirketerp-Møller, P.Ø. Jensen, K.G. Madsen, R. Phipps, K. Krogfelt, N. Høibyand and M. Givskov. 2008. Why chronic wounds will not heal: a novel hypothesis. Wound Rep. Reg. 16:2–10. Dominguez-Benetton X., S. Sevda, K. Vanbroekhovena. and D. Panta. 2012. The accurate use of impedance analysis for thestudy of microbial electrochemical systems. Chem. Soc. Rev. 41:7228–7246. Flemming H., J. Wingender and U. Szewczyk (eds). 2008. Biofilm Highlights. Springer Series on Biofilm Vol. 5. Springer-Verlag, Berlin, Heidelberg. Ge Y., T. Deng and X. Zheng. 2008. Dynamic monitoring of changes in endothelial cell-substrate adhesiveness during leukocyte adhesion by microelectrical impedance assay. A Biochim. et Biophys. Sin. 41:256–262. Hakki S. and S. Bozkurt. 2011. Effects of different setting of diode laser on the mRNA expression of growth factors and type I collagen of human gingival fibroblasts. Lasers Med. Sci. 19:206–221. James G.A., E. Swogger, R. Wolcott, E. Pulcini, P. Secor, J. Sestrich, J.W. Costerton and P.S. Stewart. 2008. Biofilms in chronic wounds; Wound Rep. Reg. 16 (1):37–44. Junka A.F., M. Bartoszewicz, D. Smutnicka, A. Secewicz andP. Szymczyk. 2014. Efficacy of antiseptics containing poidone-iodine, octenidine dihydrochloride and ethacridine lactate against biofilm formed by Pseudomonas aeruginosa and Staphylococcus aureus measured with the novel biofilm-oriented antiseptics test. I.W.J. 11 (6):730–734. Munoz-Berbel X., N. Munoz, J. Vigues and J. Mas. 2006. On-chip impedance measurements to monitor biofilm formation in the drinking water distribution network. Sensors and Actuators 118:129–134. Paredesa J., S. Becerroa, A. Arizti., A. Aguinagab., J. Del Pozob and A. Aranaa. 2013. 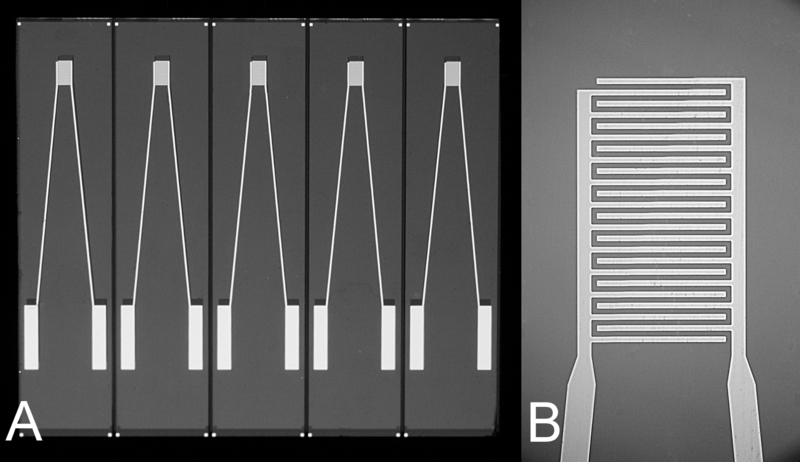 Interdigitated microelectrode biosensor for bacte­rial biofilm growth monitoring by impedance spectroscopy technique in 96-well microtiter plates. Sensors and Actuators 178:663–670. Piasecki T., G. Guła, K. Nitsch, K. Waszczuk, Z. Drulis-Kawa and T. Gotszalk. 2013. Evaluation of Pseudomonas aeruginosa biofilm formation using Quartz Tuning Forks as impedance sensors; Sensors and Actuators: B. Chemical 189:60–65. Pradeep Kumar S.S., H.V. Easwer and A. Maya Nandkumar. 2013. Multiple drug resistant bacterial biofilms on implanted catheters– a reservoir of infection. J. Assoc. Physicians India 61(10):702–707. Taeyoung K., K. Junil, J.H. Lee and Y. Jeyong. 2011. Influence of attached bacteria and biofilm on double-layer capacitance during biofilm monitoring by electrochemical impedance spectroscopy. Wat. Res. 45:4615–4622. Zhenga L., R. Congdonb, Y. Leo, S. Omowunmi, C. Marquesc,D. Daviesc, S. Bahgat, L. Lesperanced and J. Turnere. 2013. Electrochemical measurements of biofilm development using polypyrrole enhanced flexible sensors. Sensors and Actuators B. 182:725–732.